This is stunning!!! Beautiful work!!!!!! Thanks so much. Regarding hand stitching, you can start small (as did I). It is overwhelming at first but so enjoyable. My best part? It is portable! Thank you. And yes I agree using a basic pattern as Jalie 2805 I can create some exceptional looks with handstitching. Love it. Wow! This is just stunning! I’m so inspired to do some reverse applique like this on a future project! Definitely a great way to jazz up a basic pattern! Great job! You sewed up a storm! Thanks. 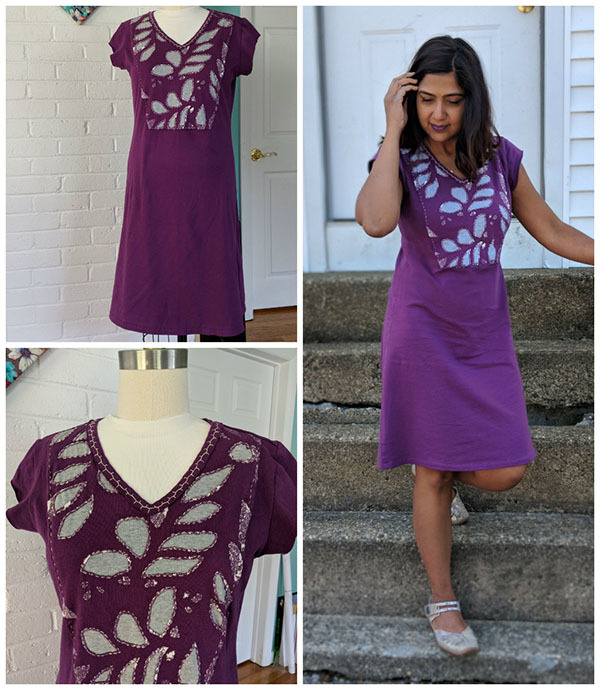 I only sewed Dia’s purple dress for this tour but decided to showcase some other pieces I had made recently. I am incredible impressed by your patience! I love that Alabama Chanin style hand stitching technique, love the results! Thank you. I hope my daughter gets a lot of use out of it. Wow! The detail on all your pieces is so unique and beautiful! Love them all! You surely have the Jalie life there, girl. Your projects are awesome! Thank you. I love Jalie patterns. I’ve never had a single fail. I never thought I’d get into it. But somehow the tiny running stitches make me feel so relaxed. This is gorgeous, and you can tell from your daughter’s face she’s pleased to have something so special from Mom’s hands. I’ve done a few reverse applique projects, but haven’t yet tackled Alabama Chanin style. Thanks. I’d love to see your reverse Applique projects. Your handstitching looks whimsical and fun! Love it! your revers applique adds such a layer of fun to the outfits! !